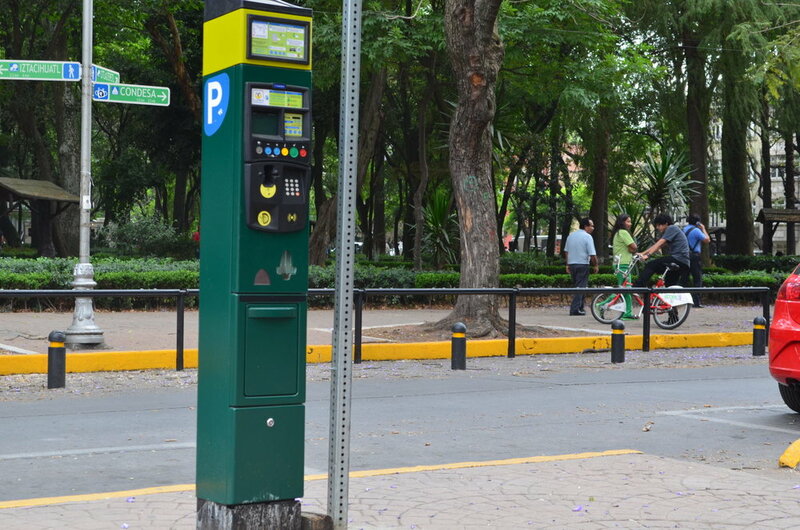 In February 2017, the Mayor of Mexico City, Miguel Ángel Mancera, made a major announcement—the city would prioritize parking reform. This announcement was the first of several from the city, culminating in the implementation of a major, progressive policy change enacted on July 11th, 2017. Pedestrian priority street, 16 de Septiembre, in Mexico City. Photo courtesy of ITDP. 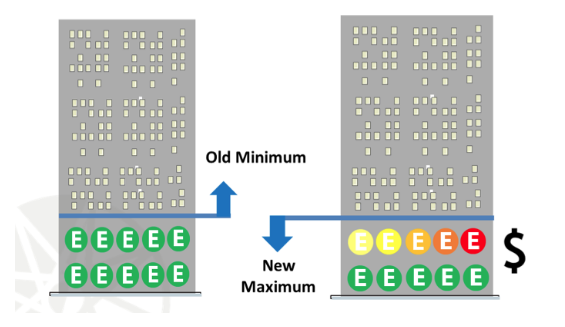 The policy, called “limitation of parking spaces in the city construction code”, changes the law from requiring a minimum number of parking spaces in a development to setting a maximum number for how many can be built. It also includes a fee from developers who want to build beyond the 50 percent maximum of parking spaces. This fee increases exponentially as the developers approach 100 percent. The sum of those fees is then required to go to improving mass transit and subsidizing housing. This reform positions Mexico City, the largest city in North America, as a leader in rethinking land use policies that favor cars and prioritizing public space for people in this rapidly growing city. This groundbreaking policy change is the result of a decade-long campaign by ITDP (Institute for Transportation and Development Policy), Menos Cajones, Mas Ciudad (Less Parking, More City), in collaboration with the Ministry of Urban Development and Housing (SEDUVI), the Ministry of Mobility (SEMOVI), and the Real Estate Association (ADI), among others. Parking lot in Mexico City. Photo courtesy of Getty Images. ITDP’s parking focus is a challenge to one of the largest unintended consequences of the 20th century model of car-oriented cities—the sprawl created in part by the amount of space a car needs when it is not moving. The demand for parking and its enshrinement as a right in public opinion and often in law, has resulted in more sprawl, less pedestrian safety, the incentivization of driving, traffic congestion, pollution, and most of all, a reduction of the space available for much more essential uses—housing and transit. Mexico City was no exception. Since 2007, ITDP has been actively pushing on-street parking reform in the city as a first step to give priority to people and not cars. In 2012, we achieved our first milestone: the implementation of Ecoparq, an on-street parking enforcement and pricing program. Before Ecoparq, unregulated or loosely regulated parking resulted in chaotic streets with illegal parking, cruising, and a perceived lack of parking availability. Ecoparq helped prove this parking saturation was, in fact, a demand management problem, and that the right policy can modify driving patterns towards a more sustainable vision and calmer streets. This was the key that opened the door to a much needed conversation: the revision and reform of off-street parking laws. Neighborhoods that used Ecoparq saw the results of regulated parking immediately, so the program has continued to expand to nearby areas. Less Parking, More City, a study released by ITDP in 2014, gathered evidence of the unsustainable trends of the city. More space was being built for parking spaces than for housing. In fact, the study found that more than 40 percent of Mexico City’s largest developments are actually parking spaces, putting parking above any other land use including housing in the city. The city was using prime, central city space for parking structures, while people were sent hours away to live in the periphery of the city. On top of this, there is much less demand than supply, and that supply was mandated by minimum parking requirements, with an incentive to build more parking. In the great majority of cases, real estate developers try to get as close as possible to the minimum required—less than 10 percent of parking spaces above the required minimum. When the parking number went over the minimum, it was often because of constraints with the site. For example, a development has a minimum of 90 parking spaces required, but due to the size of the lot, the project fits 3 stories for parking with a capacity for 40 parking spaces on each, so it makes economic sense for the developer to just build the 120 parking spaces. Once this kind of evidence was gathered and the best international practices were studied, the communications campaign Less Parking, More City was born. It brought together the diverse group of agencies and actors that was needed to make policy reform happen. This collaboration made it possible for the message to be developed and broadcast to a wide audience and was aided with a contest to reimagine parking lots for people; an idea from Juan Pardinas of the Mexican Institute for Competitiveness (IMCO), with the support of strategic allies coming from private companies, civil society organizations and a multidisciplinary jury of prestigious members: architects, urban planners, economists and public policy experts. 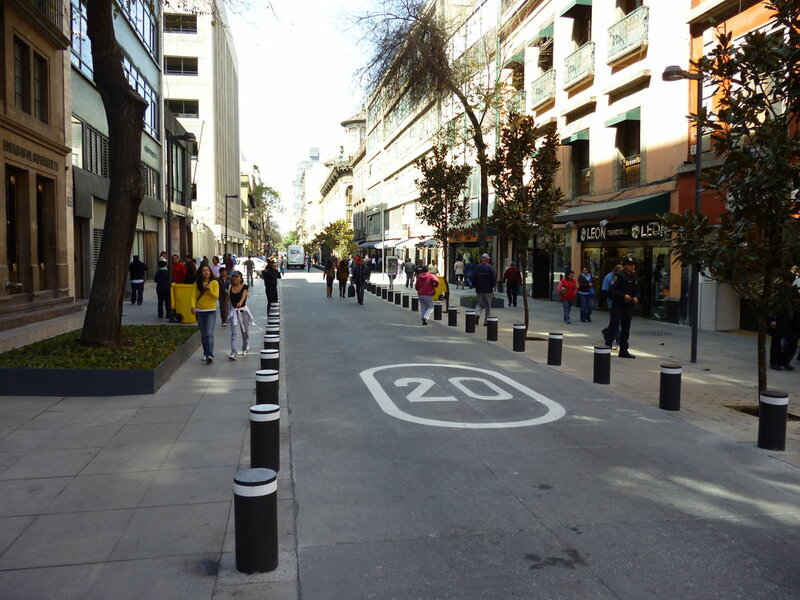 Before and after: Side lanes of busy Avenida 20 de Noviembre were converted into pedestrian seating. Photo courtesy of AEP. The list of supporters is long. This is what it takes to achieve major policy change. Agreements were made with the National Association of Supermarkets, Convenience and Departments Stores and also with the National Chamber of the Industry of Development and Promotion of Housing, with the intention to reach win-win agreements. The Local Legislative Assembly also recognized the need for policy reform, and the support of civil society was incredibly important. Bicitekas, WRI, CoRe Foro Urbano, editorial house Arquine and, of course, IMCO, were all key to creating this more powerful, cross-cutting and lasting public policy. 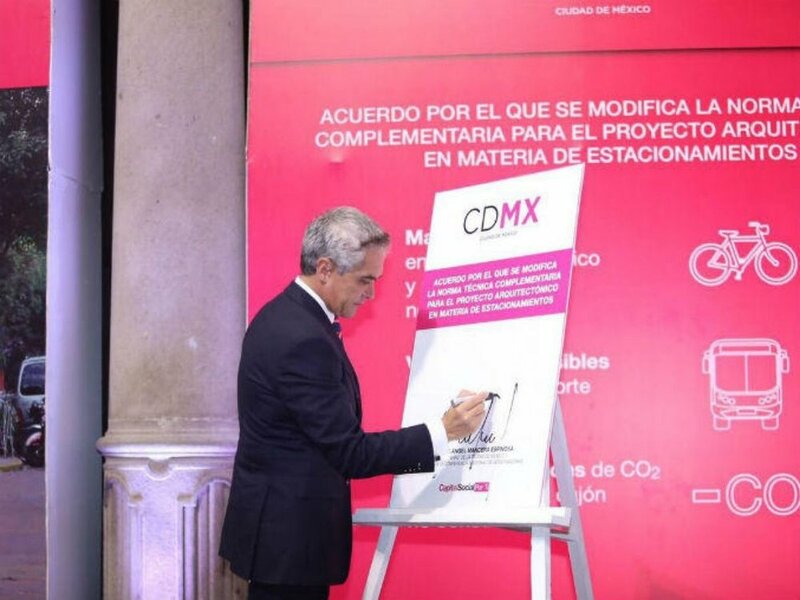 Mayor of Mexico City Miguel Ángel Mancera signing the parking reform into law on July 11th 2017. Photo courtesy of ITDP. Bernardo Baranda Sepúlveda is Latin American Director of ITDP. He has worked since 2003 on improving transport options for Mexico City and other cities.